The Acesonic SX-88 is the best microphone for a few reasons. It is the best in quality, sound, and price. 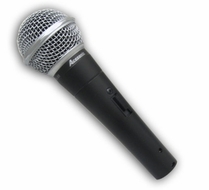 With a wider frequency response, this microphone can pick up a greater vocal range ensuring the sound coming through those speakers is indeed how your voice actually sounds. With a special filter, "popping" noises are minimized and a cardioid pickup pattern isolates the main sound source while minimizing unwanted background noise. We're so confident that this microphone will outperform or match other microphones priced as much as double the price of this one, we're offering a lifetime warranty and a money-back guarantee.